Sundried Tomato Low Carb Bread Recipe. Oh how we love bread. When we were little we had it for brekky, lunch and dinny (not really even joking!). These days we stay away from that loaf of white bread. 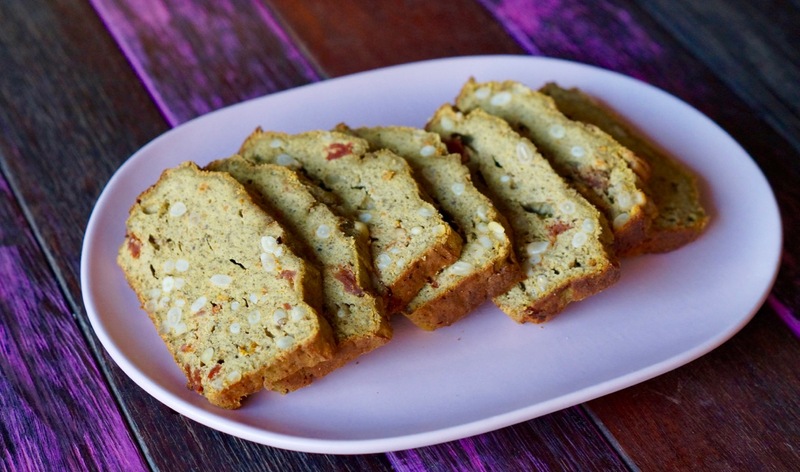 Now we make stuff like this Easy Low Carb Sundried Tomato Bread. Yes, it’s low carb bread! Not only do our taste buds love it but we feel good after we eat it! This bread is grain free, gluten free, sugar free and low carb. This bread won’t make you feel sick after (unless you’re allergic to eggs… or any of the other ingredients). This low carb bread recipe is actually easy and tastes amazing! We know we sound like a broken records coz every single recipe on this site is easy and on every single recipe we mention it BUT we have to add it! If you’ve been following us for a while you’ll probably be familiar with this recipe. It’s actually from our Make It Merry Cook Book. We have a few hard copies left! Our favourite topping for this low carb bread would have to be mashed avocado and a sprinkle of salt and pepper. Our love for avocado is pretty extreme. What about you? What would you top this bread with? P.p.s yay for healthy low carb bread! YAY! Preheat oven to 180°C (350°F) and line a 20 x 10cm (8 x 4 inch) loaf tin with baking paper. In a food processor mix the eggs and butter on high speed, until smooth (about 2 minutes). Add the sesame seeds, coconut flour, chia seeds, basil, onion flakes, salt and pepper. Whiz again on medium speed until combined. Transfer the mixture into a bowl, add the pine nuts and sundried tomatoes and mix well. Spoon the mixture in to the prepared loaf tin and place in to the oven for 40 minutes or until golden brown on top. Some like it hot! Spice up this bread and a fresh chilli!